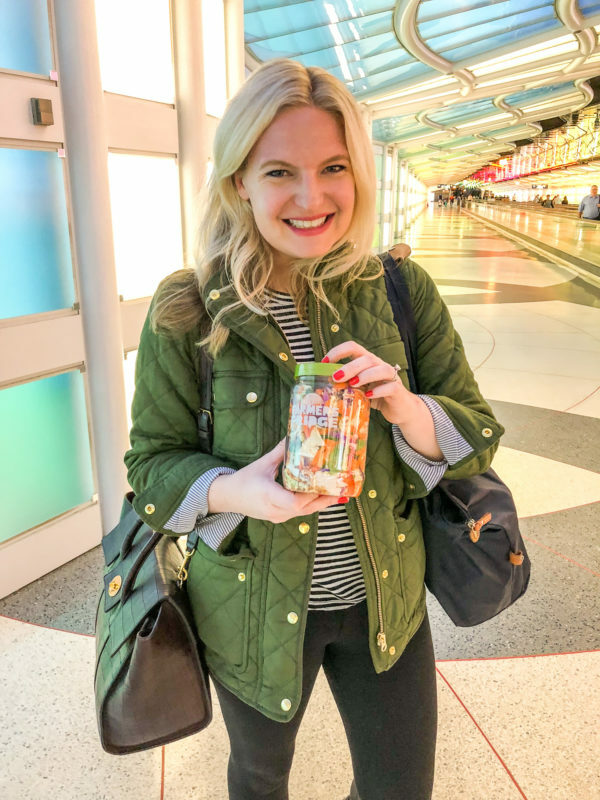 I am so excited to be partnering with Farmer’s Fridge, the Chicago-based food start-up. I first discovered them almost 4 years ago and they have been one of my favorite local companies ever since! 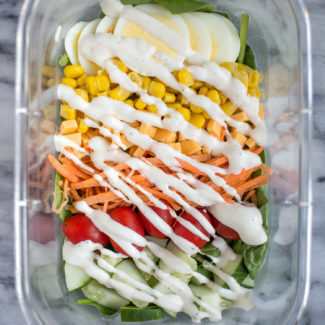 Their concept is simple and completely brilliant: they hand-make salads, snacks, and dishes every day, then deliver them to automated fridges all around the city. No matter how busy I am or what time of day or night it is, I can find a Farmer’s Fridge and have a healthy and delicious meal. There are so many good options that back when I worked at an office, I would eat Farmer’s Fridge 2-3 times a week! Farmer’s Fridge puts a big focus on finding the best food sources to create true classics like the Southwest, Crunchy Thai with Chicken, and the North Napa salads. 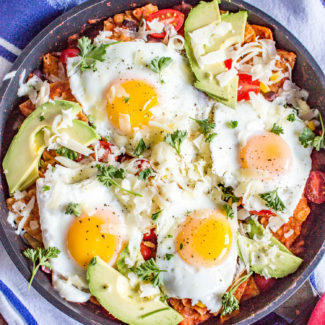 They also draw inspiration from the seasons, introducing new recipes that incorporate the best of winter, summer, spring and fall crops. 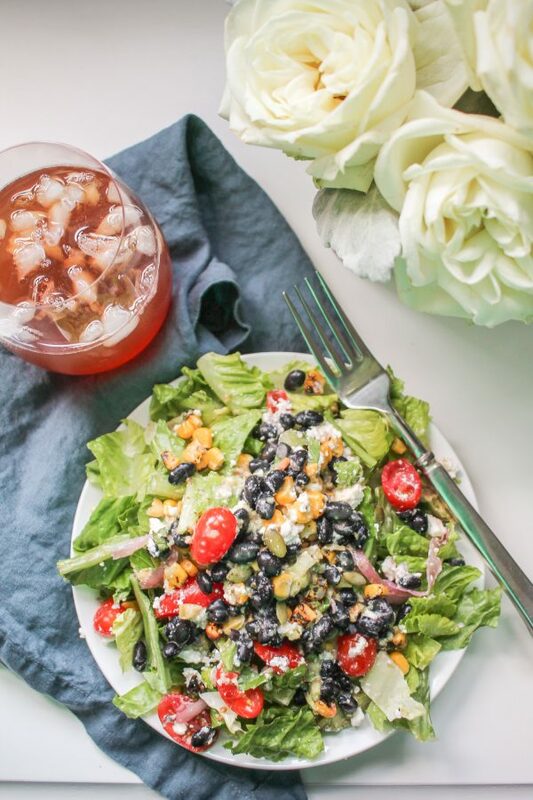 Each salad is loaded with ingredients – these salads aren’t just a bunch of lettuce and a couple toppings, they are gourmet! 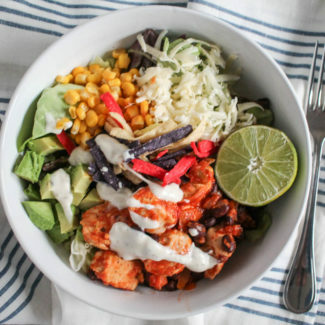 For example, the Southwest (pictured above) has romaine, black beans, grape tomatoes, fire-roasted corn, avocado, pickled onion, feta cheese, and pepitas with an avocado-lime dressing. 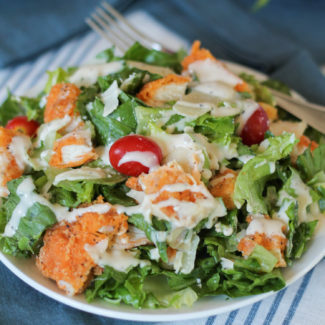 These salads are even better than most of the salads I make for myself at home. 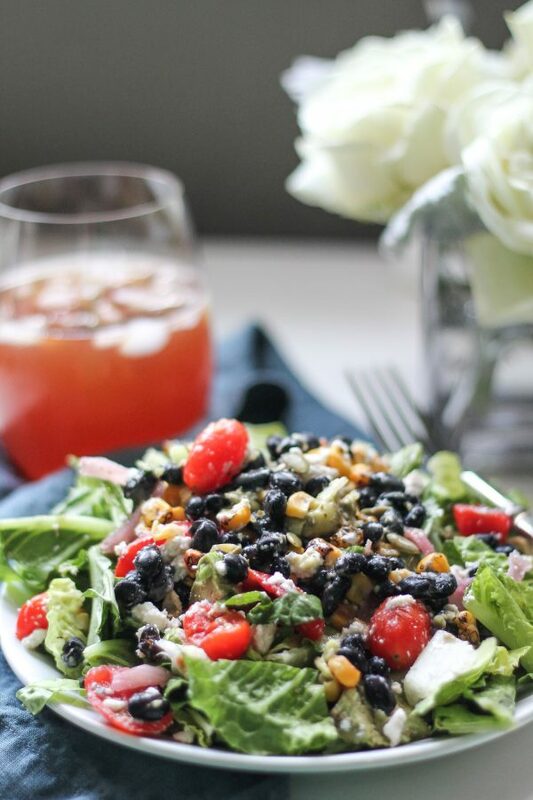 The North Napa has napa cabbage, mixed greens, grapes, cucumbers, chickpeas, avocado, feta cheese, pistachios, and dried cherries with a balsamic vinaigrette. One thing I love about Farmer’s Fridge is that you have the option of adding a protein to your salad. They sell hard boiled eggs, chicken, and tofu. Plus, the salads are a generous size, they keep me full from lunch through the end of the workday. That is a major accomplishment since I am known to search for an afternoon snack. 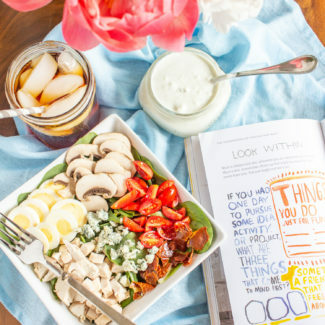 Beyond salads, I love that Farmer’s Fridge also offers great meal and snack options when I’m in search of an afternoon boost or a delicious dinner. 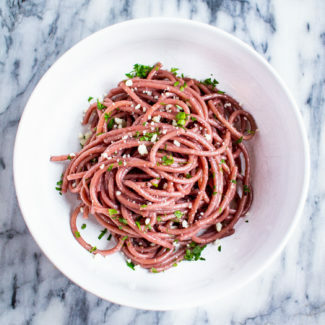 The Peanut Soba Noodles are incredible. 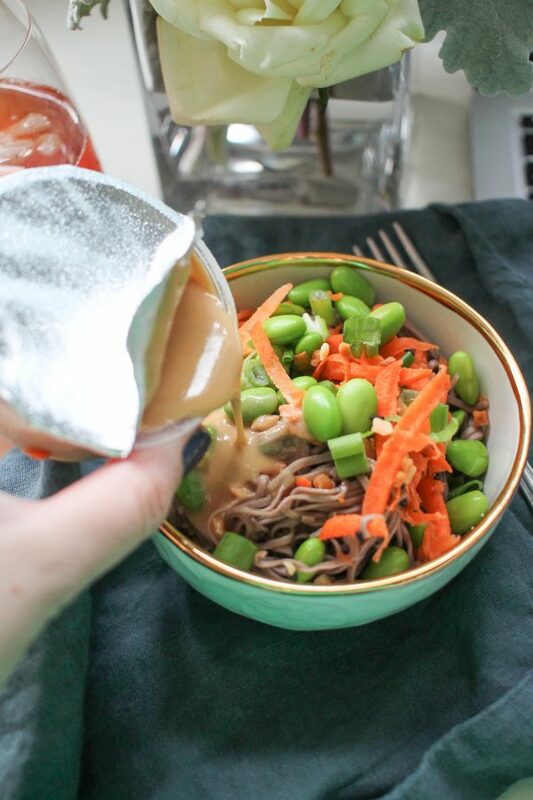 The peanut sauce is so good that I could probably drink it, and I like that they add edamame and carrot to the noodles so the meal has a good amount of veggies. 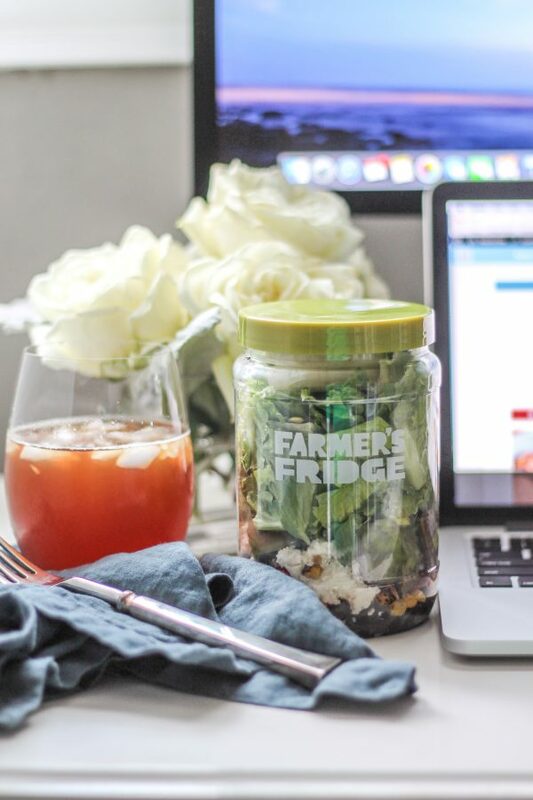 Farmer’s Fridge has been a total game changer for people like me, who are on the go but want a real meal. Not only is getting lunch quicker and easier, it’s a definite upgrade from the sad desk lunch I used to pack for myself. Even though I no longer work at a building with a Farmer’s Fridge, I am still able to find locations all over the city. 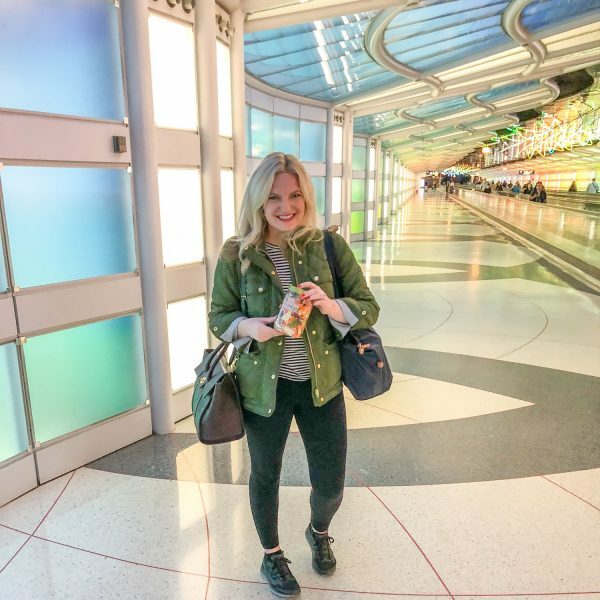 My favorite location might just be at O’Hare. I picked up a Crunchy Thai with Chicken Salad for dinner and the Almond Butter Oatmeal for breakfast before I hopped on a recent flight to London. I just put the jars in my carry-on and was set for the whole flight. It was the perfect alternative to bland airplane food. 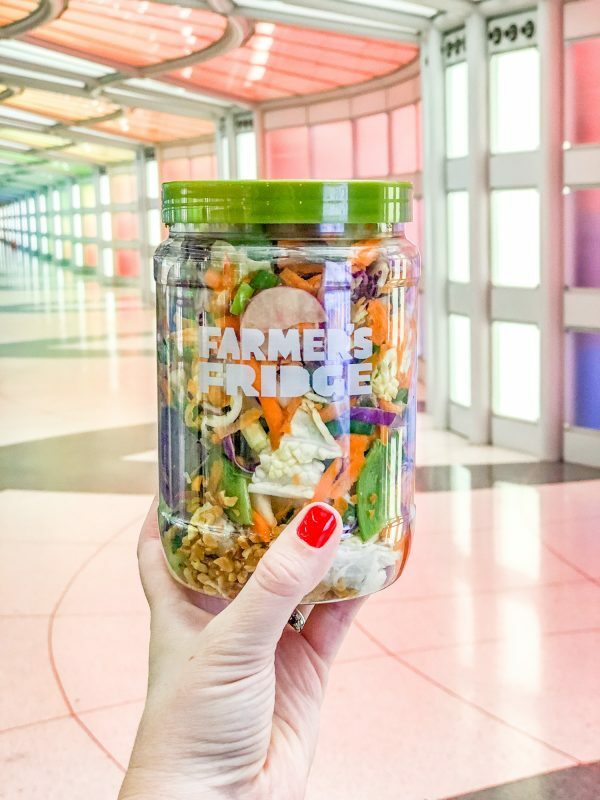 If I’m at O’Hare or on-the-go in Chicago, the Farmer’s Fridge mobile app makes it easy to find fridges nearby to pick up my favorite salad – or stock up on those Peanut Soba Noodles. If you work in the loop, Farmer’s Fridge has a location at Revival Food Hall – that is where they test new recipes before adding them to the fridges throughout the city. 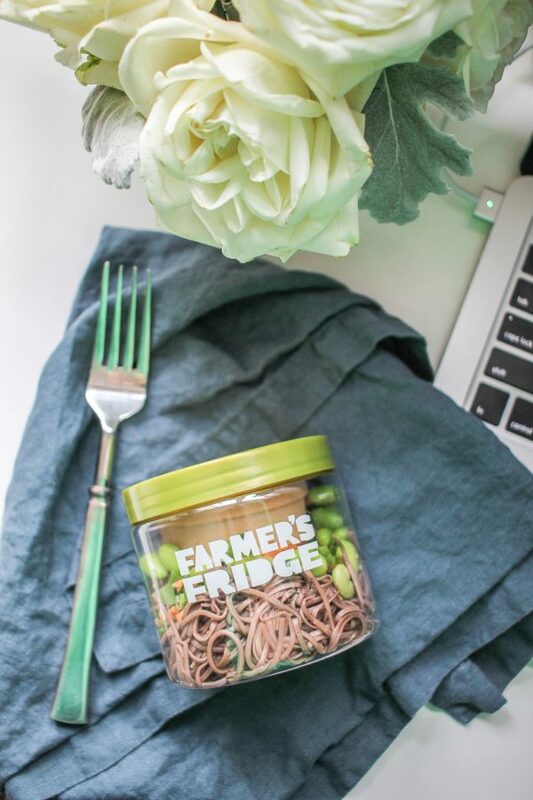 Have you tried Farmer’s Fridge? I would love to hear what you favorite menu item is! 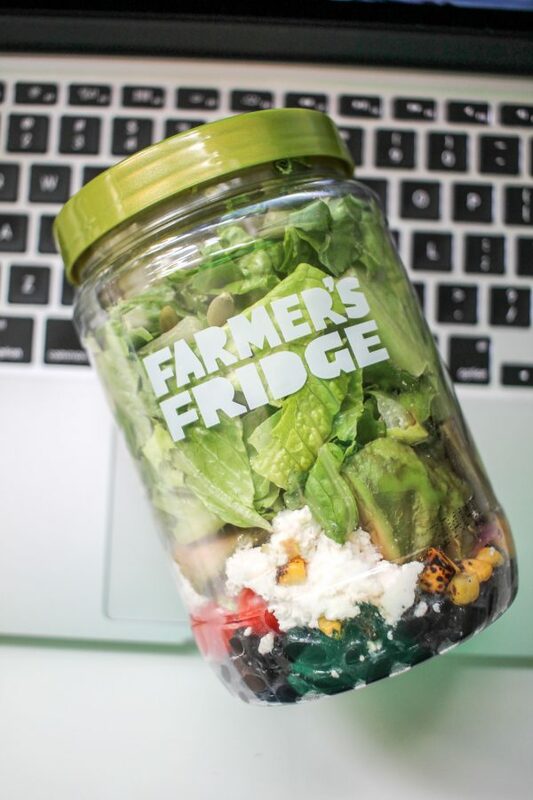 You can learn more about Farmer’s Fridge here, and find your closest fridge right here. This post was sponsored by Farmer’s Fridge, the opinions expressed are my own.